Rust stains can feel like a sneak attack. One day, your curb appeal is thriving – the next, you’ve got a deep orange eyesore detracting from the view. 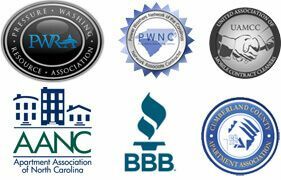 There is a solution to these stains on your positive first impression, and our team is here to correct them. Some water sources contain trace amounts of iron. When the iron interacts with water, rust happens. This is a common occurrence on patios and sidewalks, where spray from your sprinkler system may overflow too the surface. Rust issues caused by Irrigation systems can be some of the most frustrating stains to navigate for clients. After removing the stain, our team is happy to provide recommendations on how you can prevent the issue from making a comeback . Lawn furniture, decorative elements, architectural details: if they contain metal, they’ll trigger rust when they’re exposed to moisture. This leads to a concentration of buildup and an ugly eyesore to match. This isn’t actually a rust stains, but it does have a similar appearance. Battery acid stains are caused by – you guessed it! – a leaky battery and are often linked to landscaping equipment and golf carts. Rust doesn’t disappear with a good scrub. It requires a specialty cleaning approach to remove the source of the buildup and the stain. We deliver both. 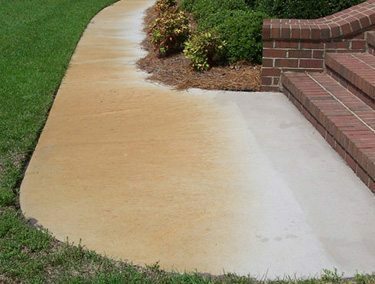 With our innovative rust removal system, we can deep-penetrate the affected area to ensure that your property reclaims its great curb appeal… Sans rust stains.